A central episode in the history of the American Revolution comes under thoughtful examination. 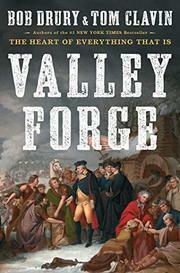 The story of Valley Forge is a trope in America’s sense of itself, a morality play in which beleaguered, stalwart soldiers outlast the ferocious elements in order to wrest freedom from imperial oppression. The reality, ably told here, is far more complex—and far more interesting. Drury and Clavin (co-authors: Lucky 666: The Impossible Mission, 2016, etc.) open with the desperate engagement at Monmouth Courthouse in the summer of 1778, the first major battle the Continental Army fought against the British after being defeated at Brandywine nine months earlier. That defeat had led to the loss of Philadelphia, but now the British were withdrawing to New York. They faced an American Army made resolute by six months’ retreat to Valley Forge, which cost thousands of lives to disease and weather but that also turned the Continentals into a disciplined fighting force. Some of that transformation was due to the influence of European officers; some came about through institutional reforms and increased congressional funding. There was much reform to be done. As the authors write, George Washington found considerable challenges simply in taming his rivalrous commanders; when one of those newcomer Europeans was elevated to senior rank, “Washington’s squabbling collection of more experienced and longer-serving brigadiers revolted.” The cast of characters is impressive, among them a pre-treasonous Benedict Arnold, a sharp-edged Lord Cornwallis, and an Anthony Wayne who would soon reveal why the adjective “mad” should have been applied to him. In the authors’ account, Washington emerges as fallible but indispensable; it is hard to imagine that another commander would have had the same success in the face of so many hardships. A bonus is the authors’ examination of what happened to the principals after the war, ranging from death by chicken bone to enshrinement at Westminster Abbey. A fluent, readable story that corrects mythmaking errors and provides a more nuanced narrative in their place.